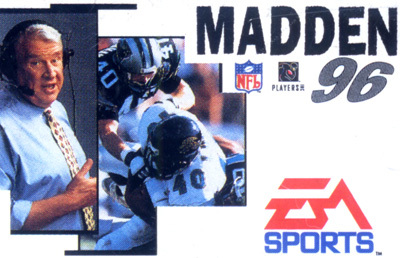 Madden NFL '96 is a football video game. It features John Madden on the cover. In this edition secret codes can unlock special teams. The AI has been boosted and can now hurry in two-minute drill situations, kill the clock when ahead late in the game, and cover the receivers with better efficiency. Also, the Create A Player feature was added, which included many position specific mini-games that would determine the ability of your player. It was also the final year for FOX NFL support.